Although qualitative approaches to psychological research have a long history in the discipline, they have also been, and remain, marginalized from the canon of mainstream scientific psychology. At the current moment, however, there is growing recognition of the importance of qualitative methods and a movement toward a more inclusive and eclectic stance on psychological research. 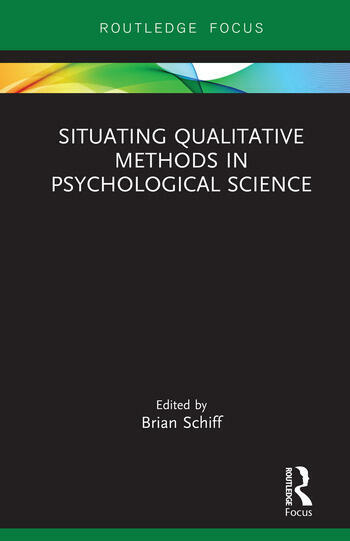 This volume reflects upon the historical and contemporary place of qualitative methods in psychology and considers future possibilities for further integration of these methods in the discipline. Scholars representing a wide-range of perspectives in qualitative and theoretical psychology reflect on the historical and contemporary positions of qualitative methods in psychology with an eye to the future of research and theory in the discipline. This book encourages a more critical and inclusive stance on research, recognizing both the limits and contributions that different methodological approaches can make to the project of psychological knowledge. Chapter 2: Quantitative, Qualitative, or Mixed? Should Philosophy Guide Method Choice? Chapter 7: Qualitative Psychology’s Coming of Age: Are There Grounds for Hope? Brian Schiff is Professor and Chair of the Department of Psychology at the American University of Paris and Director of the George and Irina Schaeffer Center for the Study of Genocide, Human Rights and Conflict Prevention. He is the author of A New Narrative for Psychology (2017), editor of Rereading Personal Narrative and Life Course (2014), and co-editor of Life and Narrative: The Risks and Responsibilities for Storying Experience (2017).